With a successful day of plastering behind us, we opted for some lighter fare today. E! 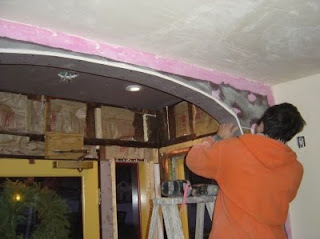 was doing research, while I busied myself with little tasks, like hanging radiators (not yet hooked up though), installing window trim in the bar, and starting to drywall the main entrance. It has a curved top, which we decided to keep. 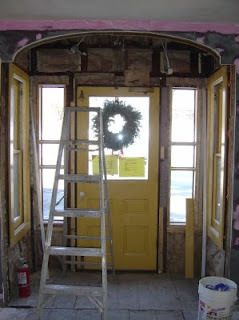 Drywalling an arch is not difficult. You cut a strip of drywall, score it in the back, and screw it on. In the picture you can also see the lights I hooked up in the front entrance. Yes the bennies came out good. What a ridiculous thing to be so excited about an egg not dissolving in water but it's a big victory when it happens. And hopefully it will happen a lot in the future so don't be shy - come on by! Things are looking so great over there and I'm giving myself a long weekend next weekend and bringing a friend so maybe we will come by and see the progress in person! 0810jejeMême si chaussure nike roshe run homme pas cher la fleur est pantropique, les Philippines ont néanmoins considéré la fleur comme un de leurs rares chaussure nike blazer bouquets indigènes, tout en utilisant l'ylang-ylang et les bouquets de air jordan 5 doernbecher buy waling-waling. Un sac à dos Dickie est généralement un choix extrêmement Air Jordan 12 Chaussures intelligent. Nike Max Air Traditionnel BW Brun foncé Les adidas zx flux femme rouge techniques de la jambe blanchie sont certaines de vous permettre de chaussure nike femme cortez devenir très à la mode dans l'œil des autres! Ces types de air jordan femme flight chaussures avec le design spécifique semblent extrêmement reconnus par d'autres air jordan noir et rose femme personnes! Humour indiqué le collier de formation épais rembourré réel ainsi que la langue.